Green jersey courtesy of 99 awesome donors! 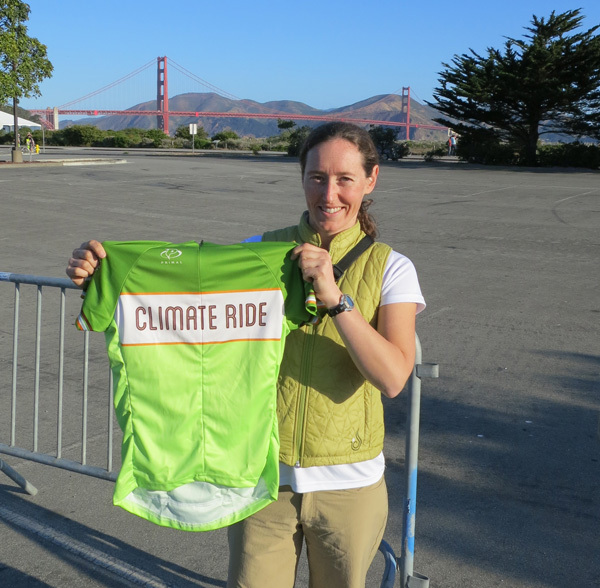 I just checked in for Climate Ride, and soon, Team Tracey will hit the road. At registration, I picked up my official jersey as well as another exciting item of apparel: a green jersey for being one of the top ten fundraisers overall. Check it out! While I knew my fundraising goal was ambitious, I never expected that it was enough to rank #9. I can’t say thank you enough to everyone who’s donated and helped me raise over $5,700 thus far. And if you’ve been meaning to give – or you’re freaked out by the recent news from Maona Loa – or you want to provide a little extra motivation as I tackle those crazy California hills – it’s not too late. I’d love to break $6,000. Click here to donate now. Otherwise, final preparations for the adventure are almost complete. Little A should be back from her swim lesson in about fifteen minutes, and then we’ll repack her day bag for the drive north. Grandma and Grandpa – who have been trying to ingratiate themselves with tattoos and gifts, and who received unheard-of good-night kisses last night – are checking out of La Quinta and should be here a little before 10:00 a.m. And then we’ll start the long drive to Fortuna, where we’ll connect with the rest of the TransForm Carbon Crushers and hang with some Humboldt friends at the Eel River Brewery for dinner. If you’re familiar at all with California’s north coast, you know that it’s kind of remote. I am hoping to post some updates here over the coming five days, but I have greater confidence in text messages squeaking out in areas of spotty coverage. So follow me on Twitter @shannontracey or check my Facebook page for more frequent, if grainy, photos and updates. And now it’s time to pack up the laptop, pack some cheese sticks for A, and double-check to make sure there’s nothing we’re forgetting. Thanks again to all 99 people who’ve donated – and to others who have pitched in immeasurable intangible ways, particularly Sara Marcellino and of course, Peter. Here we go! !